Peel, a startup that’s looking to turn your iOS device into a super-powered universal remote (among other things), has some big news: it’s just closed a $16.7 million Series B funding round led by Ravi Mhatre of Lightspeed Venture Partners, with participation from existing investor Redpoint Ventures and several seed investors. Last month we took a thorough look at how Peel is setting out to become to the bridge between your iPhone (or iPad) and your home theatre system — both in terms of actually controlling your myriad devices, and in presenting you with content you’ll want to watch. First, you purchase Peel’s special hardware ‘fruit’, which looks like a plastic pear and is available from Apple retail for $100. This device sits in front of your home entertainment system (it actually looks like a nice ornament on a coffee table). Next, you install Peel’s application from the App Store. Connect the Peel device and your phone to the same Wifi network and you’re off to the races. The app walks you though a setup process (you have to ‘teach’ it what kind of television, surround sound receiver, and other components you’re using). After around ten minutes you should be all set: you can now control your entire home entertainment system from your phone, and as the Peel device receives each command over Wifi it will ‘blast’ the appropriate infrared signal to each component. 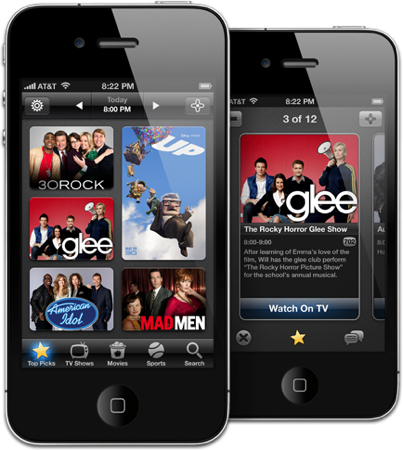 But Peel isn’t just a remote control — the startup also wants its mobile application to be a content discovery engine. Instead of showing you a basic TV Guide-style grid of upcoming shows, the app presents thumbnails of shows that it thinks you’ll be interested in. The more shows you watch, the better the system should get at recommending more content. The company also plans to integrate deeper social features. Peel says that it will be using the money in part to bring the mobile app to more platforms (like Android) and to sell the Peel ‘fruit’ in more retail outlets. Here’s a video interview I did with the founders in March.